It hasn't even been out a month. Less than two weeks ago we reported that Devil May Cry 5 was Capcom's second-biggest launch on Steam ever, behind last year's Monster Hunter: World. 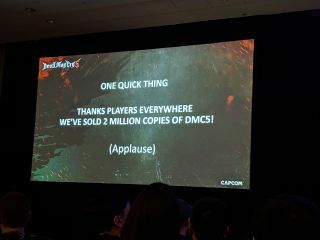 Today, at a talk at the Game Developer's Conference in San Francisco, director Hideaki Itsuno announced that Devil May Cry 5 has already sold more than two million copies. That sure sounds like a smashing success for a game launched on March 8. Capcom is definitely on the upswing: Resident Evil 2 Remake has performed significantly better than its first-person predecessor Resident Evil 7. It's all enough for Sam to suggest that the publisher has entered a new golden age.